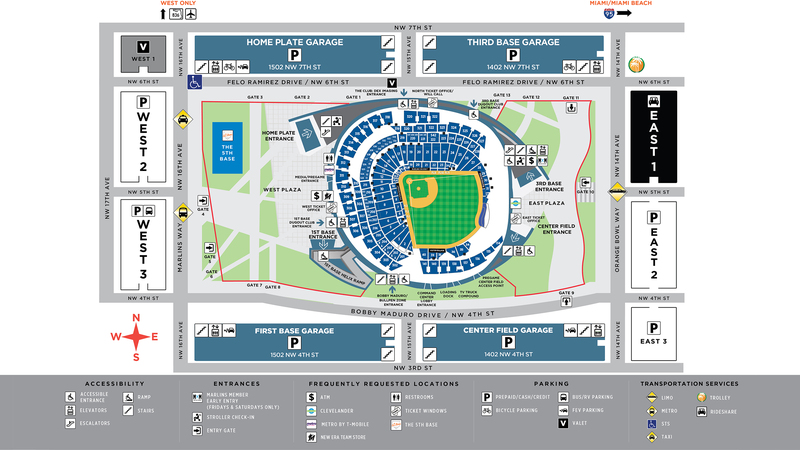 The four on-site parking garages are conveniently located on the North and South sides of the ballpark. Limited surface lot parking is also available on the West and East sides of the ballpark. All parking areas offer a full complement of ADA accessible spaces except our W3 surface lot which serves our community as a youth baseball field when not used for parking. Parking is not assigned. Guests wishing to park in a certain garage are encouraged to arrive early. Miami Police Department will direct cars to the garage or lot of their choice based on traffic conditions during peak ingress times. Marlins Members are able to choose their parking facility of choice. On-site parking is limited and based on availability. Online sales end 2 hours prior to first pitch. Paying at the garage entrance upon arrival will cost $5.00 more and is subject to availability. Valet Parking is exclusive for The Club: DEX Imaging and suite holders and is located in front of The Club: DEX Imaging Entrance.